If you own a restaurant or a business that needs a blender, buying a residential blender to save some money can be a costly mistake in the long run. Residential blenders often don’t last long and have major drawbacks if used in restaurants. For commercial use, you need blenders that are built for commercial use. For the best run, you must buy a best commercial blender that offers top value for your money. Commercial blenders often look similar to residential blenders but have a much higher price. Some people often get confused and buy residential blenders thinking, why pay more for the same thing? But this is a mistake. Residential blenders are not designed to handle heavy use in restaurants and bars. If you buy a residential blender for commercial use, chances are you have to buy a new one within a month or two. So make sure to do it right the first time. To make it easier for you, we have listed three of the top commercial blenders that can help you kick-start your business in 2018. AIMORES latest model to its commercial blenders is an excellent fusion of strength, style, and technology. The advanced AS-UP998 is designed to obtain the best nutritional value from the ingredients. In addition, it has some advanced features that are often missing in some other similar blenders. It is a programmable blender that allows you to achieve much more than an ordinary traditional blender. You can switch between multiple functions with ease. 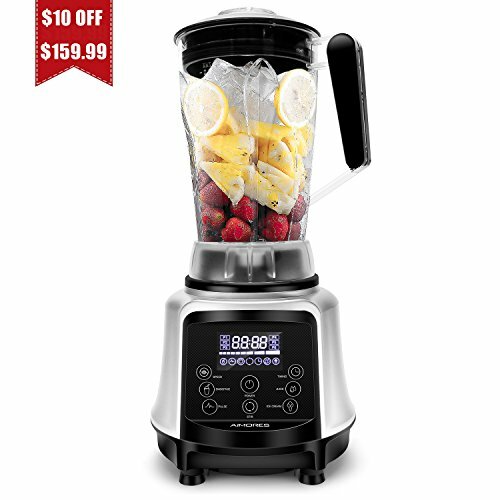 It allows you to blend to prepare smoothies and other drinks, chop to coarse ingredients, crush to prepare frozen fruits and ice cream, grind to prepare grains, spreads and nut butter, heat to prepare toppings, soups, and sauces, and to use it as juicer to prepare fruit and vegetable juices like an old-fashioned way. The reason why it makes to our best commercial blender list is its sturdiness and power. It is built to last long with the high-quality motor. The technology used makes sure the blender gets you a higher yield of nutrition. The high-speed motor combined with sharp blades cuts through the cells of ingredients to get you the best nutritional value. The most common uses of the AIMORES Commercial Blender are to prepare ice cream, smoothies, and juices. It also uses four pillar spoiler design that is more suitable for blend and vortex foods to tiny pieces. It is approved by FDA and ETL that makes it safe to use. Can be used to blend, crush, cut, chop, grind, and to prepare the puree. With so many features, some people find it difficult to follow the manual. 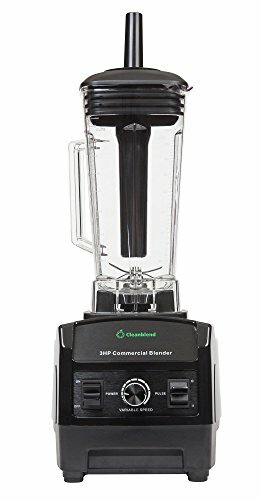 The Cleanblend commercial blender is considered among the high-performance blenders that are not too heavy in your pocket. The three HP commercial blender uses a powerful 1800 watt motor with eight stainless steel ultra-sharp blades that can cut through each ingredient for best nutrition yield. In terms of power, there are not many other blenders that offer the same power with this number of blades. The capacity of the container is also almost two liters that makes it a good option for commercial use. The container also features a tamper like Vitamix that makes it unique. The blender can be used for multiple purposes that include blending of puree berry seeds, making fine-textured smoothies, juices, and mixed drinks. In addition, you can also use it to crush ice, liquefy soups, and blend frozen fruits. In fact, you can prepare complex foods like nut butter within a minute. Three horsepower or 1800 watts motor power which makes it one of the most powerful commercial blenders available in the market. The blender features a pulse option and a manual. It does not include preset speed dials for different foods. Aicok is relatively a new brand, but its commercial blenders are at par in quality and functionality with other big brands. It also uses a powerful motor with six ultra-sharp stainless steel blades that can easily cut through the toughest of ingredients. The container also has a large capacity that can be used to prepare juice, soup, smoothies, and to crush ice. You can also switch between different speeds to prepare smoothies and juices. The jar uses premium grade Tritan technology that makes it temperature resistant. You can also prepare hot soups with the blender. It also ensures that the smoothies you prepare using the blender offer you best nutritional value. It features a 1400 watts motor. All three blenders are some of the best currently available on the market. Each offers different strengths, so you may want to buy one that makes a perfect fit for your needs. If you are looking for power and ability to cut through the toughest of ingredients, Cleanblend is the best with three horsepower motor and eight ultra sharp blends. But if you prefer style, modern technology, more functions, and programmable blender, the AIMORES AS-UP998 model is a better option. Cleanblend also offers five years warranty compared to the one year warranty of AIMORES. Aicok is a relatively new brand, but it offers a lifetime warranty as well. It is also the most affordable option out of the three. All in all, it is up to you to choose between the three based on the use, features you are looking for, and the budget you have. All three are great options and offer great value for your money.